Over a year ago I announced Socratrees, a platform to support online argumentative discussion. Complex interrelations between different statements which make up an argument are often hard to follow, or hard to contribute to, when forced into a linear format. This is an unfortunate characteristic of essentially all modern media used to present arguments and host discussions. 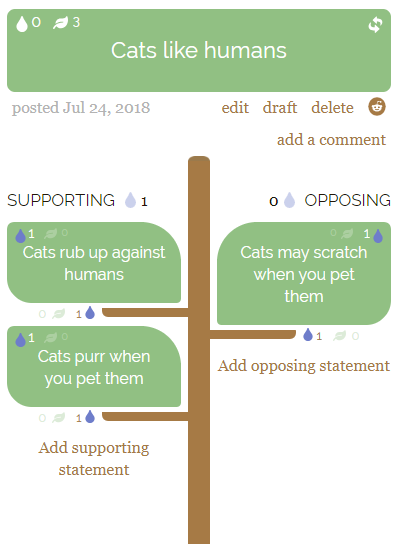 Socratrees offers an alternative by outlining arguments into intuitive hierarchies of supporting and opposing statements. Transparency first: our primary goal is not to find out who is right or wrong, but to improve transparency of thought. Finding common ground: encourage consensus building, to build unity. Inclusiveness: represent all opinions, also minorities and repressed groups. Since the start of this month, the site is now in private beta during which we will evaluate how well our current design supports these goals and how it can be approved upon. This contributes to research on argument technologies. Join private beta and help us make discussions great again! Previous Previous post: Is Microsoft finally embracing ubiquitous and activity-centric computing with Microsoft 365?